Mike Treder, Managing Director at the Institute for Ethics and Emerging Technology, notes that ALL those who disagree with him that Global Warming is going to kill billions unless we invest more in wind farms are either stupid or evil. One would think such a manichean understanding of a complex system would only be found in rural bars were everyone has a chain attached to their wallet. I prefer to be called evil. Of course, the press responded by noting how ridiculously stupid and offensive that remark is. I'm not running for office, so I'll say I think that's about right. One could nuance that, by saying 'The most melancholy of human reflections, perhaps, is that on the whole, it is a question whether the benevolence of mankind does more good or harm (Walter Bagehot). Or that 'The poor don't need money or pity, they need temperance, diligence, thrift and other bourgeois virtues'. Or that 'The ultimate result of shielding men from the effects of folly is to fill the world with fools' (Herbert Spenser). Same idea. I think what's considered so offensive about the remarks is it implies these people are poor, in large part, because they aren't very bright. That means it's not someone else's fault, and thus responsibility, and thus the rich might just eat them like Soylent green! For a post-Christian society, we sure hate to judge, just like our bible-thumping predecessors. Better to point out the exceptions to 'disprove' the generalization, and say 'there but for the grace of God go I'. Studies continue to show that revisions are informative, causing mean announcement-returns of 1% to 2.5% for up revisions and -1% to -2.5% for down revisions. The total value of these announcement-returns points to the release of enormous information value by revisions, given their great frequency. But they note that many of the revisions occur overnight, and they often accompany company information, such as a new product release or earnings guidance. So, focusing only on analyst revisions that occur intraday, and focusing on a 40 minute window around the forecast revision, generates a measly 0.05% price move. So, ignore all those talking heads, and glossy binders by your broker? No! It turns out, there is information in analyst forecasts, specifically, shorting your broker. In Long-Term Earnings Growth Forecasts, Limited Attention, and Return Predictability by Da and Warachka, they find that if you take the long-run earnings growth and divide by the recent earnings growth, you get a straightforward metric of optimism: higher is more optimistic. It turns out, the highest decile has a 4% annualized lower risk-adjusted return than the lowest decile; more optimistic stocks have lower returns. A simple explanation (see here) is that mutual funds "herd" (trade together) into stocks with consensus analyst upgrades and (especially) herd out of stocks with consensus downgrades. Stronger fund herding occurs when analyst recommendation revisions are more unanimous. However, there is some information that analyst recommendations are more useful at the industry level. Portfolios long in industries about which analysts are optimistic and short in industries about which analysts are pessimistic generate significant abnormal returns (see here). So, listen to your broker's advice on sectors and stocks, just remember to short the stock picks. I don’t want to comment on Posner. He’s a nice guy. But I spend my life trying to understand this stuff. My last two papers, which took me three years, were on determinacy conditions in New-Keynesian models. It took me a lot of time and a lot of math. If Posner can keep with that and with Law and Economics, good for him. Note he avoids actually confronting anything specific in Posner's argument or providing any argument of his own, and merely points out he knows a lot of math and some parochial modeling expertise. Now, investigating 'determinacy conditions in New-Keynesian models' (see here) seems very high tech, and he does absolutely nothing to explain to the intelligent, but uneducated reader what this means. It is really bad form, using pretentious jargon to avoid argumentation. In the context of what he investigated 'for the past two years', determinacy conditions just means whether one can say that Fed interest rate targets can moderate inflation by itself, independent of say, the monetary aggregates. We don't have enough data to determine if that is true. Now, given the way interest rates and inflation have behaved, with a long secular trend up from 1950 to 1980, then back down to today, that should be obvious. It's basically two datapoints. Ideally, we need hundreds of such periods. That we don't have enough data to define optimal monetary policy is only an abstruse concept if you are being disingenuous. Every technical debate in economics comes down to a pretty common sensical debate, and if you can't articulate it in such a way, you are either an idiot-savant who does not understand what the models really mean, or you are trying to brow-beat outsiders via intellectual intimidation. As Cochrane wrote a very nice piece on how to write a good economics thesis, he knows better. There's a famous story about the great mathematician Leonard Euler, and the French philosopher Denis Diderot, who created te first encyclopedia. They were both visiting Russia on Catherine the Great's invitation. The Empress didn't like Diderot's arguments for atheism, and was concerned such arguments were influencing members of her court, and so Euler was asked to confront the Frenchman. Diderot was informed that a learned mathematician had produced a proof of the existence of God, so he agreed to view the proof as it was presented in court. Euler appeared, advanced toward Diderot, and in a tone of perfect conviction announced, "Sir, (ab+n)/z=x, hence God exists—reply!". Supposedly Diderot stood dumbstruck as laughter erupted from the court. Of course, the 'proof' is total nonsense. It's not clear how true that story is--surely it's embellished--but it reflects a common tactic by those with specialized skill: hide behind parochial terminology. Some economists like to say you can't have a defensible opinion on the economy unless you fully understand Turnpike theorems, value functions, or set theory. These are model paradigms, and the relation of a model to reality, in economics, has been more hope than reality. All model paradigms in macro have been irrelevant to reality, so the onus is on them to demonstrate they aren't part of parochial status game fancied by academics. Bohr's model of the hydrogen atom isn't 'correct', with an electron circling the nucleus in the way a planet circles the sun, but it gives one some useful intuition. That is really all any economic model can aspire to. The idea that an economic model will allow one to estimate parameters that predict something with the right digit, is the hope of all non-physical sciences, but they haven't been successful. The New Yorker had some thoughtful interviews with two leading financial economists. Fama is here, and John Cochrane is here. I would add, Shiller didn't say there was a housing bubble in 2006. Specifically, he said some the recent increase in housing prices was unsustainable, and some markets might experience a decline in housing prices. That was entirely consistent with the disastrous assumption that nationwide housing prices will not fall, and has somehow turned into a clear call of an imminent market correction (and Shiller deserves some moral blame for not correcting this common statement because it distorts reality in his favor at the cost of rewriting the past). Possibly, but it’s not obvious how “stimulus” is going to help this recession. Think about an unemployed accountant in New Jersey, fired from a big bank. How is going to build a road in Montana going to help him? Keynes thought of a world in the nineteen-thirties where labor was more amorphous labor. If you hired people to dig ditches, that would solve the unemployment line in the car industry. We have very specialized labor, and just hiring people doesn’t resolve the problem. Somebody who lost their job in a bank—building more roads is not going to help them. Joseph Stiglitz, a Nobel economics laureate visiting Venezuela, said developing nations must strike a balance between public and private control of the economy. By using annualized Sharpes we can compare apples to apples. As returns are linear in time, standard deviation increases by the square root of time, so one needs to have a common time to make Sharpe ratio comparisons. Now, for many strategies, one is predicting the profit on the combination of a specific tactical rule with a model that generates an expected return. For example, if I think the market is going up, one can take advantage of this several ways: buy futures, options, bull-call spreads, etc. This adds degrees of freedom to the result, because often certain criteria can generate different Sharpe ratios. I will assume one implements a linear position rule, such that a position is linear in the expected return of the strategy. Thus, if one expects a return of 1%, one has half the long position as when one expects a return of 2%; if one expect a return of -1%, one has the opposite position as when the expected return is 1%. It is the proportionality between signals that affects the Sharpe ratio, not the absolute size, because whether I invest, on average, $1k or $1MM, it will have the same Sharpe ratio. As to whether linear is optimal, intuitively it is pretty close to optimal, basically saying that if conditional variance is constant, you put down twice as many chips as when you expect twice the return. Thus, assume we are forecasting a return, which can be a portfolio, or a single stock, it does not matter. Some ‘thing’ has an expected return. This has a forecastable and nonforecastable component. The proof for that is quite tedious (see Bohrnstedt and Goldberger, 1969), and crucially relies on the Gaussian distribution to avoid extra complexity from higher moments (that’s why we love the normal!). The nice thing is that the numerator, ρx,y, is just the square root of an R2! That is, whatever your f, the R2 of a regression of the return on f, is what you need to know to calculated a Sharpe ratio. The last step is to annualize, to put this into consistent units. To do this we simply apply the adjustment. For strategies that are not necessarily done over calendar time in constant increments, we assume t=number of sequential trades per year. This generates the following adjustment. You multiply the Sharpe by the square root of the expected number of trades per year. So, in this equation, you meake sure you have the number of expected trades in there, t.
So, with an R2, and trading frequency, we can generate a reasonable Sharpe. For example, in the graph below, we see how the R2 of Sharpe 1.0 strategies vary by the number of trades made per year (eg, a horizon of 1 month trades 12 times a year). So, an R2 when forecasting annual data, is not nearly as valuable as the same R2 over 1 week. That's obvious on some level, but I think it's nice to have a specific formula to make such comparisons. An important qualifications is that transaction costs are not addressed here. The higher the frequency of the strategy, the higher the importance of transaction costs. A paper by Mark Grinblatt and two Finnish guys whose names I can't pronounce (Linnainmaa & Keloharju), took data from Finnish military IQ tests, and combined them with transactional data on the Helsinki Stock Exchange. The paper is cleanly titled, "Do Smart Investors Outperform Dumb Investors?" 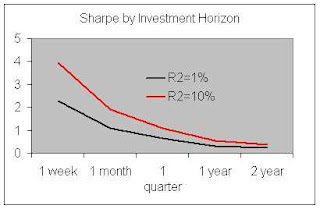 This study analyzes whether high IQ investors exhibit superior investment performance. It combines equity return, trade, and limit order book data with two decades of scores from an intelligence test administered to nearly every Finnish male of draft age. Controlling for wealth, trading frequency, age, and determinants of the cross-section of stock returns on each day, we find that high IQ investors exhibit superior stock-picking skills, particularly for purchases, which earn up to 11% more per year than the purchases of below average IQ nvestors. Wouldn't it be interesting if, instead of expected returns being a function of an asset's risk, it was a function of the investor's smarts? It seems plausible, indeed, I argued in my book that alpha is not really a function of an asset, but rather, of the investor. Gold, day-trading, futures, are not really attractive in themselves, but rather if they are consistent with your relative skills. They group investors into a stanine distribution, where 1 is low, 9 is highest. The highest IQ group has a 4.4 basis point return advantage, looking at their picks on day t-2, and return on day t. This annualizes to 11% (252*.00044), but that isn't very realistic, because you can't trade that much. The advantage peters out, as after two months the return advantage is only 0.5 basis points. The paper notes a distinct short run advantage to high IQ traders. This seems to make sense, but one should remember investing is not a sprint, but a marathon. Grinblatt and company show higher IQ investors are more diversified, and trade less, than their stupid counterparts, so it does seem like those who trade benefit from smarts. I think this is a lot like noting that smarter gamblers are better gamblers, because everyone in this paper is trading all the time, for edges of basis points, when the transaction cost merely on the bid-ask is 100 basis points. The really really smart (wise?) people do not gamble at all, because they know the long-run house edge kills any edge they might have. In trading, trying to make money with trade horizons less than a year, the only way to make consistent money is to be an insider, why brokers have nice yachts ('where are the customer's yachts?'). The best stock strateg is something very passive, because a 4 basis point edge does not overcome transaction costs, whereas a simple strategy of buying, say, low volatility portfolios generate a superior Sharpe ratio and is very feasible. As we move into our new era of greater government, there are many signs of the new regime. One is the great deference by risk managers to regulators, turning what was once a promising intellectual field into a subservient rationalization for whatever the regulators appear to want, conventional wisdom on steroids (ie, rigorous and common yet often irrelevant). Another is that rents in DC are approaching those in New York. as Henry Kissinger noted, power is the ultimate aphrodisiac, so it seems Orszag left his earlier wife (all for 'change'), had an out-of-wedlock child with an attractive heiress, and has a future wedding to 31-year-old journalist Bianna Golodryga. I guess lines like 'Mind if I compute the rotation coefficients of that symmetric bilinear pairing?' work, as long as you are minding a $3.5T budget. Just fyi, I'm only going to do 1 post a week. I might have a brief one in between. I'm now pretty ensconced in an interesting full time job working on quantitative issues related to equities and their options, but I know enough not to discuss it directly. I can't write much about what I work on most of the day, and my opportunity cost of blogging has made daily posting impractical. So, check in once a week, I appreciate any comments and read them all, even when I don't respond. A good test of a theory is to ask the simple question: can it more parsimoniously explain the world better than the status quo? I argue that people are primarily driven by envy as opposed to greed (see here), so they are mindful of their relative, as opposed to absolute, position, and this leads to doing what others are doing as a mechanism of minimizing risk. In contrast, a standard utility optimizer looks at how to generate a maximum return for a given level of portfolio volatility, broadly defined to include human capital. Now consider, investment advisers generate tables of risk and return, and ask their client where they want to be? They do nothing of the sort. Instead, they generate extensive commentary of hot issues, major market sectors that are growing or shrinking, because notify what sectors where investors should shun or increase. This creates the occasional bubble, though that is an unintended consequence. Understanding the prominence of envy over greed has several other implications. For example, there is a known home bias, where people overinvest in their home country. From a strict mean-variance perspective this makes no sense, because adding Germany and Japan to an American's portfolio would be a first-order diversification tactic. But if you are mainly concerned with keeping up with your neighbors who primarily invest in the US, then the home bias makes perfect sense. Another key implication is that happiness is not a function of aggregate wealth, so even as wealth per capita has risen immensely over the past 100 years, we aren't all that much happier. This is known as the Easterlin Paradox, because it is a paradox to standard asset pricing theory. Self interest was at first derided as amoral, Machiavellian, but first Adam Smith showed that it could generate socially desirable results through unintended consequences, though to this day many find this fanciful. Evolutionary biologists like David Hamilton and George C. Williams showed that self interest could lead to altruistic instincts towards are families. Game theorist showed that rational, far-sighted self interest produced 'win-win' outcomes, as in the iterated Prisoner's Dilemma. Given the conspicuous failure of socialism in 1989, wealth maximization is intellectually defensible on moral, societal, and libertarian grounds. There is no such bright side to envy, which does not generate any salubrious unintended consequences. People rarely say what they mean when targeting a goal because the indirect route is usually more efficient in the context of working within a collective where others have competing goals, and so selectively emphasizing process or results to the act or the rule, allows a great deal of rationalization. Efforts at redistribution invariably are framed as win-win or part of a broader altruism, when in fact it is merely taking from the rich just as Stalin expropriated the Kulaks. Christina Romer, an economic advisor to President Obama, notes that we can reduce the cost of health care by basically taxing premium care out of existence, which only makes utility maximizing sense (ie, sense to an economist) if you think those who consume more than others directly hurts those who consume less, intuition given our common envy (see page six, top paragraph here). Paul Krugman baldly states that universal care is the progressive objective for health care, as if distribution were all that mattered. As Greg Mankiw noted, health care reform would lose its impetus if it were revenue neutral; the redistribution isn't a side benefit, its the main point. We are an envious little species. This is why there is no general risk premium, but has many other footprints, such as the desire for redistribution, why we aren't twice as happy as our great-grandparents, or ten times as happy as those living in Guatamala, why people have a home bias, etc. (my book goes over these in more detail). It is also why the moral superiority of self-rule is self evident to most people, regardless of how incompetent and inefficient the local rulers are (no one is proposing Britain, US, or Italy take over Zimbabwe, Afghanistan, or Ethiopia, regardless of the anarchy in these countries). Envy is why, regardless of how well an immigrant group is doing relative to their home country, or even anywhere else in the entire world, if they are doing below average in America they are presented as dispirited victims--how can you be happy if you have all the creature comforts you can manage, but less than average in America itself? Egalitarianism is the essence of diversity, which is the primary principle championed by modern universities. The idea that redistribution of money and power--progressive taxation, making wealthy individuals kowtow to elected officials--is suggested as win-win, but there's no data suggesting that affirmative action has ever raised a group out of its inferior socio-economic position, or generated anything but further friction. It remains popular, however, because its short run effects are directly attractive to most people, who have no problem rationalizing taking money and power from those at the top. John Adams made sure the USA had many republican features because he worried that "There never was a democracy yet that did not commit suicide", an opinion first articulated by Thucydides in the fifth century BC. I think this is because mob rule unleashes the envy of the masses, which brings down the best, and in the process the talented tenth, the elites, that drive anything worth cumulating upon in the realm of ideas (and thus, art, science, and technology). Under the elevation of diversity as an end in itself, envy is almost shameless now. In sum, envy is a better description of what motivates people in general, and underlies currently popular politics and progressive intellectuals. We can rationalize the desire to take from those with more under various pretexts--reducing health care costs, rectifying racism, improving the financial system--but only because the mind is very good at confabulating (eg, taking money from the top 5% is often presented as an altruistic disposition). People aren't utilitarians, and academics are usually only utilitarian when they presume it is consistent with egalitarianism (eg, Peter Singer arguing that giving everyone positive rights is utilitarian). I don't believe 'ought implies is' anymore than 'is implies ought', so I'm comfortable knowing my pragmatic utilitarianism that emphasizes the the virtue of liberty is not what most other people think is good policy. My only comfort is that I believe most educated egalitarians would admit their beliefs are untenable if they weren't also consistent with utilitarianism, that there is a trade-off between equality and efficiency, and that their instincts are more base than the dismal scientists every imagined.